On May 19, Los Straitjackets—aka "America's Instrumentalists"—will release their latest album,What’s So Funny About Peace, Love and Los Straitjackets, viaYep Roc Records. 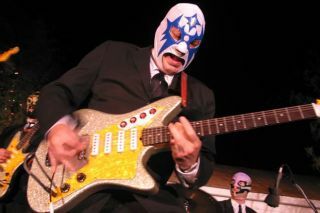 Exclusive Song Premiere: Los Straitjackets — "It’s Monster Surfing Time"
We've got a special treat for you this weekend: the exclusive premiere of the brand-new album from "America's instrumentalists," Los Straitjackets. Stream Jet Set via the SoundCloud widget below. On June 7, Jimmy Vivino and Los Straitjackets hosted a benefit concert for guitarist Daddy-O Grande (Danny Amis) at the historic Mayan Theatre in downtown Los Angeles. In the summer of 1973, I was 20. I had moved to LA to be a songwriter with a piano player by the name of Dave Bloom. We were sure we were the next Lennon/McCartney -- or at least Leiber/Stoller.